Former Hindu Sai Anand shares glimpses of his journey from Hinduism to Christ and tips on how to reach out to Hindus. Original content can be found here. My life as a Hindu was torture. I’d get up in the morning, go to the temple, and perform rituals I wasn’t able to connect with. I’d look at the idol, telling myself the god it represents is real but knowing it isn’t. I slowly realized there wasn’t concrete evidence for a lot of the stories and beliefs behind Hinduism. Many people continue in the faith because it’s what’s been taught to them by their parents. But I had my doubts. By God’s grace, during college I heard about true liberation offered from the true God: Jesus Christ. He has changed my life and beliefs about everything. Even with all my doubts, though, this is what I used to believe as a Hindu. It’s difficult to fix a number to how many gods there are in the Hindu faith—the highest estimate is 333 million. The gods have different characteristics and abilities, so Hindus will pray to different gods for different requests. 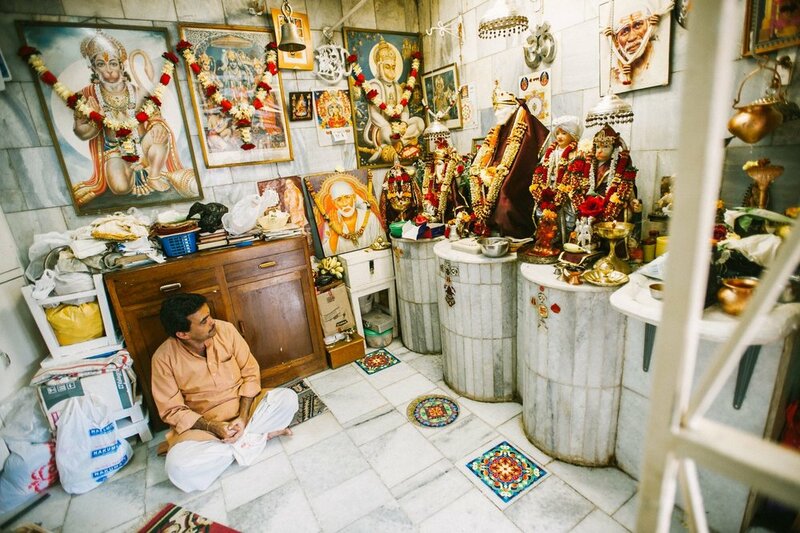 A Hindu sits in his idol shop in Kenya. He sells images of Hindu gods to Nairobi’s Hindu population of 600,000 people. Photo from IMB Photo Library. The concepts of omniscience or omnipresence aren’t attributed to Hindu gods, so Hindus don’t know whether the gods, or the particular god they’re appealing to, recognize or acknowledge their sacrifices. Because Hinduism mixes so many beliefs, Hindus believe there are multiple sacred texts. The Vedas are ancient religious texts believed to have been revealed by gods to scholars, who then passed them down orally. After centuries of oral tradition, the texts were put into writing. An Indian woman reads Hindu scripture at a temple in Malaysia. Photo from the IMB Photo Library. There are four Vedas, each with its own theme. Some have hymns, rituals, and prayers that Hindu priests use. Others give meditations, mystical teachings, even theories of creation. They were written in the ancient language of Sanskrit. But most Hindus don’t know Sanskrit, so they don’t read the Vedas. The Bhagavad Gita is another sacred scripture that has more popularity in Hindu culture because it’s been translated into languages people read today. It’s part of the greater book, the Mahabharata, and is a 700-verse poem about how completing a life’s duty leads to salvation. One of the more famous and liked Hindu gods, Krishna, is a main character who counsels the story’s hero to fulfill his duty by going to war against his friends and family. Worship, most of the time, means sacrifices to appease the anger of the gods, who are known for lashing out against sin. They will punish you if you do something wrong. The inevitability that you’ll do something that angers a god is overwhelming. Hindus visit local temples to make sacrifices, give offerings, pray, light incense, and meditate. Worship can also be performed at shrines in the home or along the road. For Hindus, the morning rituals usually include self-purification and prayers to the sun. Many Hindus will also visit the temple in the morning. But they can’t go to the gods whenever they want; the temple isn’t open at all hours of the day. A Hindu worshiper lights candles to gain blessing from Hindu gods at a temple in Nepal. Photo from IMB Photo Library. Hindus believe in the unceasing cycle of life, death, and reincarnation. Your karma—the result of your actions, good or bad—determines how you will be reincarnated in your next life. There isn’t a way to know if you’ll be reincarnated to a better life or whether what you’ve done is deserving of hell. There is a general belief in a “hell” where you are punished, though there are believed to be many different hells. A man prepares to light a cremation pyre on fire at Pashupatinath Temple in Kathmandu, Nepal. Photo from the IMB Photo Library. One of them, where Yama, the god of death is thought to live, is called Nakara. Some Hindus believe that people who sin greatly are sent to Nakara for temporary punishment before being reborn again into a lower status than their previous life. I’ve found practical applications of Scripture, the gospel, and truth are needed when sharing the gospel with Hindus. Those who are interested in the gospel will have many questions, which is understandable because Hindu beliefs are built so strongly into culture. It’s a major worldview shift, and they need to see how the gospel works itself out practically in the life of a Christian. Christians must demonstrate how the gospel practically affects your life, your choices, your demeanor. You are the gospel’s evidence of how Christ can change lives. Talking about love and a direct and personal relationship with God is revolutionary for Hindus because they don’t have a connection to the gods. And that a god would love us—that’s pure gold. When inviting a Hindu to church, then, it’s important that the ambiance of the church is welcoming. If the gospel is forcibly or angrily presented, it will often push them away because of the anger so present in Hinduism. Preach the truth in love. When I’m honest about the change in my life, people understand that my household belongs to Jesus. I don’t hide the reason for why we’ve made changes—why we don’t make sacrifices or go to the temples. I don’t fear my community’s disdain. Spirituality is not a topic Hindus usually avoid, so don’t be shy about it. Be gentle but straightforward when you share the gospel. Your confidence in Christ, your life, your behavior, your graceful nature, your willingness to forgive, and your calm and composed mind is what will demonstrate to Hindus that you belong to Christ and are not of this world. Many Hindus truly want to know how to have a relationship with God. Perhaps God has appointed you to be the one to tell them.